Landowners planting forests for carbon credits should plant pine trees rather than natives to achieve the best returns, a carbon consultant says. 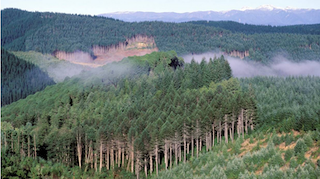 Ollie Belton, a partner of Permanent Forests NZ a Christchurch-based carbon consultancy, said that the rate that natives absorb carbon dioxide was much lower than for pinus radiata. Sequestration calculations used by the Emissions Trading Scheme for forests under 100 hectares showed that pinus radiata absorbed almost 1000 tonnes of carbon over 25 years, while native forests absorbed less than 300 tonnes. Belton said measurements he had done on native forests of more than 100ha showed most performed less than the ETS calculations, some only achieving a half to a third of this. In contrast, many pine forests performed better than the default figures. "When you go out and measure the sequestration rates in native forests the numbers are low. So it is hard to make a case economically for indigenous forestry." The one billion trees by 2028 programme and Government planting grants totalling $238 million meant it was a great time to be planting trees.